Looking for an event that everyone can enjoy, from kids to grandparents, and everyone in between? Or want to celebrate the last days of summer before school starts? Then make plans to attend BedaFest! The fun happens on Sunday, August 19, from 1:oo – 7:00 pm at La Cuesta Ranch in San Luis Obispo. Family Fun. Food. Biers. It’s all Here. 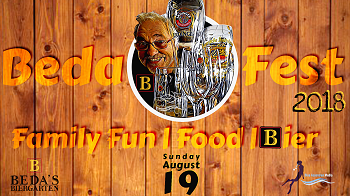 The second annual BedaFest is hosted by Beda’s Biergarten—San Luis Obispo’s German restaurant known for authentic recipes, a wide variety of German and European biers, and the friendly and welcoming spirit (known as gemütlichkeit) of owners Beda and Helga and the entire team. “I want BedaFest to be a day when everyone can get together and have a good time,” said Beda Schmidthues, co-owner of Beda’s Biergarten. While the inaugural event in 2017 was called Beda’s Beer Journey, its focus was still on fun and a family friendly atmosphere. Those pretzels! They’ll be a star attraction at BedaFest, along with many other menu favorites from Beda’s Biergarten. 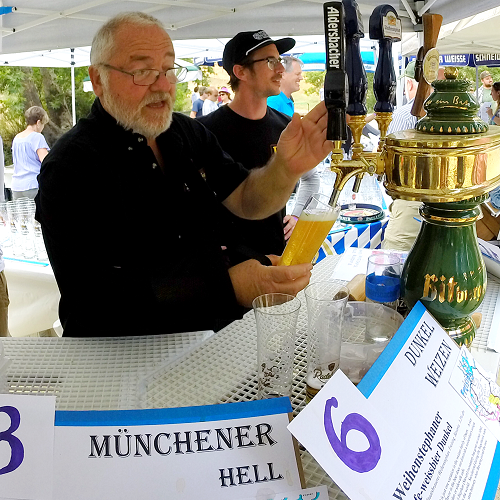 “We decided to rename it BedaFest to reflect that it’s an event for all, no matter what age, and that it’s about fun… not just bier,” he said. BedaFest gathers together the best of Beda’s Biergarten—food, fun, and biers—at the scenic and historic venue just north of downtown San Luis Obispo. Here’s a sampler of what’s in store. Many of Beda’s Biergarten’s fan-favorite dishes will be available for purchase. 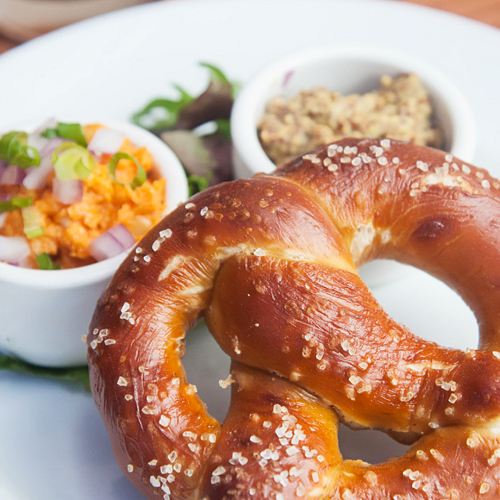 You can start with the amazing chewy pretzels and Beda’s sauerkraut, made with apples, bacon, and onion. Salads include cole slaw and kartoffelsalat (potato salad with pickles, onion and creamy mayo dressing). 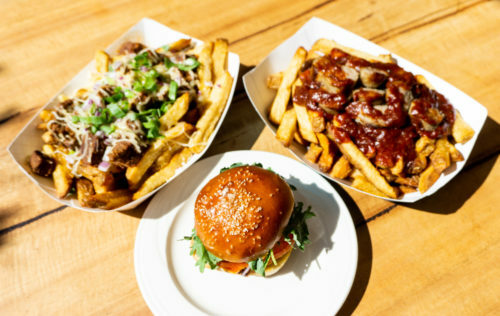 Three varieties of fries, with and without goulasch or sausage, a bratwurst platte, and three sliders round out the options. And cookies for dessert. Beda’s currywurst fries, goulasch fries, and silders. Oh my. San Luis Obispo’s fun-loving Brass Mash provides the musical backdrop for BedaFest. This brass band (with trombone, tuba, drums, saxophone, and trumpet) plays rock, pop, and funk tunes with a sound that will get you up and dancing. When we said fun for everyone, we meant it. New this year is Beda Ball: a special ticketed game to raise money for a local charity. For every $5 ticket you buy, you’ll get two chances to try to hit the target of Beda’s face. Each score supports a local charity. This year, the recipient is Surfing For Hope, a local nonprofit that helps families going through cancer treatment. Games, games, and more games make for a fun afternoon at BedaFest. 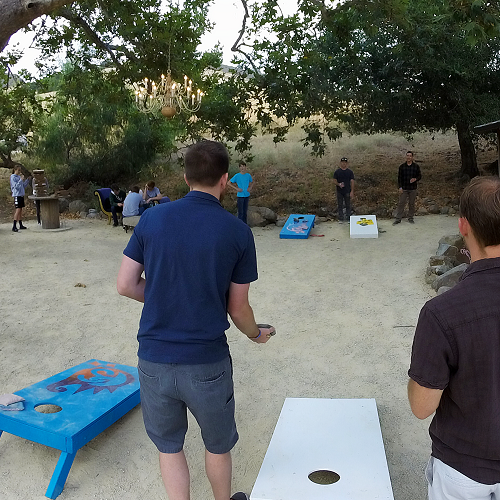 The stakes were high at the 2017 corn hole playoffs. The free games included in your general admission ticket are for kids, the family, and adults. There will be kids games, and grab your family and friends of all ages to play corn hole, giant Jenga, and try your skills at several foosball tables. If you’re an adult, frisball adds lighthearted competition to enjoying a bier. Local nonprofit Surfing For Hope will receive proceeds from your purchase of special tickets for the Beda Ball charity fundraising game. Established in 2012, Surfing for Hope Foundation helps ease the difficulty of cancer patients and their families through the healing powers of surfing and the ocean life. Its annual Longboard Surf Contest fundraiser is October 6 in Pismo Beach. In between matches of Jenga and BedaBall, you can enjoy the grounds of the scenic La Cuesta Ranch. The historic barn shows its past as a working cattle ranch, and it’s also a popular wedding venue. Speaking of biers, nine biers from Germany, Belgium, and Czech Republic will flow from colorful taps. Hard cider, wine, and non-alcoholic beverages will also be available. Schöfferhofer Weisssbier: has a pale, hazy profile indicative of an unfiltered beer (5% ABV). It begins with a distinctive, slightly sweet floral aroma that unfolds into a rich yeast flavor. Hints of cloves and spice last throughout, complemented by lemon zest and slight hop dryness. Hofbräu Oktoberfest Märzen: rich, full-bodied deliciously bitter taste (6.3% ABV). It’s as special as the Beer Festival itself. Gulden Draak: Belgian strong dark ale is a high fermentation beer, using wine yeast for the secondary fermentation (10.5% ABV). It can be enjoyed as an aperitif or dessert. Two new biers will be unveiled for the first time ever at BedaFest. Stay tuned for more about this exciting announcement. Beda and Andrew pour biers at the 2017 BedaFest. Your General Admission ticket includes one raffle ticket (and you can purchase another ticket at the event). Raffle prizes include German bier-branded merchandise and glassware, soccer balls, and larger prizes. Who doesn’t love the “Beda’s Is the Wurst” slogan? Lucky for all of us, BedaFest will have lots of “wurst” items for sale: hats, t-shirts, tank tops, glassware, and more. Missing BedaFest could be your “wurst” day ever. So avoid that sad fate and get your tickets today. Space is limited to ensure your fun. Click the green button below to get your tickets to the event! Because Beda doesn’t do anything that’s not fun!